According to a new market report published by Transparency Market Research titled ‘Optical Lens Edger Market – Global Industry Analysis, Size, Share, Growth, Trends, and Forecast, 2018–2026,’ the global optical lens edger market is expected to reach US$ 651.3 Mn by 2026, expanding at a CAGR of 6.5% from 2018 to 2026. North America held a significant share in the optical lens edger market in 2017. The global optical lens edger market is expected to be driven by factors such as rise in demand for optical lens edgers from the ophthalmology industry and rise in the use of digital cameras. However, the global optical lens edger market is expected to be challenged by the three aspects of maturity in the production cycle. Rise in demand for in-office finishing labs in the ophthalmology industry is likely to offer attractive opportunities to the market. Simplified, efficient, and automated edging equipment is trending in the global optical lens edger market. In terms of type, the semi-automatic lens edger segment constitutes a dominant share of the global lens edger market. This is because semi-automatic lens edgers are affordable compared to automatic optical lens edgers and are more effective in terms of precision cutting compared to manual optical lens edgers. The automatic lens edger segment is expected to expand at a prominent growth rate during the forecast period. This is due to the advent of technology and availability of automatic lens edger with better precision. In terms of application, the eyeglass lens segment constitutes a share of over 70% of the global lens edger market. This is due to a significant number of consumers opting for lenses. The camera lens segment is prominent, both in terms expected growth rate and current market share. A rise in the number of photography enthusiasts and professionals is expected to boost camera sales. This, in turn, is expected to boost the growth of the optical lens edger market. In terms of region, North America accounts for a dominant share of the lens edger market. The market in the region is projected to expand at a sluggish pace compared to that in Europe and Asia Pacific. Market penetration in North America is already high. The market in Asia Pacific is anticipated to expand at a high growth rate as Chinese and Japanese companies such as Nidek and Shanghai Supore Instruments Co. are expected to enter into the largely untapped market in the near future. The U.S accounts for more than 75% share of the market in North America. It is expected to continue to dominate the market during the forecast period, owing to its large consumer base of eyeglass users. The market in Canada is likely to expand at a rapid pace. Germany constitutes a prominent share of the optical lens edger market in Europe. A high consumer base of eyeglasses drives the market in the country. The market in the U.K. is expected to expand at a rapid pace as the market in Germany and France is relatively saturated. Spain and Italy combined are projected to account for one fifth of the lens edger market in Europe during the forecast period. The market in the countries is driven by the high adoption of eyeglasses among consumers. China is a dominant country of the lens edger market in Asia Pacific. Production of lens edgers in the country is high. Chinese lens edgers are the cheapest lens edgers available in the market. The market in China is mainly driven by the availability of low-cost lens edgers. Prominent market players in China –include Ningbo FLO Optical Co and Nanjing laite Optical Co. ltd. The market in India is expected to expand at a rapid growth rate during the forecast period, owing to high demand for optical lens edgers from the eyeglass lense and camera industries in the country. GCC is a leading sub-region of the lens edger market in Middle East & Africa. It is estimated to dominate the market during the forecast period. The market in South Africa is expected to be driven by a favorable political environment, which is enabling the setting up of more factories and resulting in higher sales of lens edgers. Brazil accounts for 50% of the lens edger market in South America and is expected to continue to dominate the market in the next few years. The market in Brazil is likely to be driven by high use of eyeglasses among the population. The Rest of South America constitutes a minimal share of the market. The market in the sub-region is expected to expand at a sluggish pace in the coming years. The optical lens edger market is characterized by the presence of a number of local and regional players and intense competition among them. 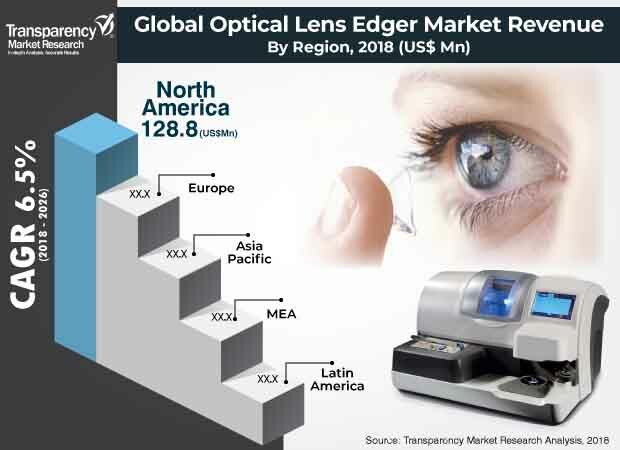 Some of the industry participants in the optical lens edger market are Essilor International S.A., Topcon Corporation, NIDEK CO., LTD., INNOVA Medical Ophthalmics Inc., Coburn Technologies Inc., Huvitz Corp., Mei Srl, Santinelli International, and Shanghai Supore Instruments Co. Ltd.